Wow. What a film. During the opening introduction at the Berlin Film Festival, Norwegian filmmaker Eskil Vogt explained that too many films always feel the same, they're always too predictable, and he wanted to make something different. Something that could even surprise him. And he has done exactly that. Blind, the first feature from writer/director Eskil Vogt, is deserving of the adjectives "brilliant" and "innovative" in the way it twists storytelling conventions and delivers the unexpected; something fresh, a film that stands alone. It's uniquely captivating and surprisingly thoughtful, with a wonderful performance leading the way. Blind follows a married woman named Ingrid, played by Ellen Dorrit Petersen, who is blind. She was not born blind, but went blind earlier in her life, allowing her to recall images in her mind. After first meeting Ingrid and listening to her explain the situation and what it's like to live this way, we're also introduced to a few other characters, who at first seem to have their own completely separate storylines unfolding. The overlapping narrative is brilliant in its concept and execution, and is part of the unexpected nature of this film. Watching it is like being caught up in a riveting mystery, trying to figure out what's going while never feeling too out of touch. It's best to save the revelation of the multiple stories for the experience of the film. Along with the concept itself, what the film is actually about is the great struggle to live and love after going blind. How hard it must be to remain in love and be intimate with someone when it's hard to even find your way around an apartment, or cook food, or figure out what to wear. It touches upon this struggle from the perspective of a woman, making it even more tender yet still brilliant in the way it dives into her mind and the way she thinks, and how this changes her interaction with her husband and those around her. It's almost as if Charlie Kaufman took a few passes at the script. She gets jealous, she gets sad, she gets frustrated, but it's utterly captivating seeing her work through all of it. Especially because it is so innovative, yet caring. 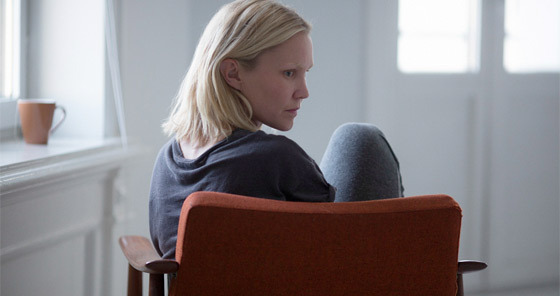 Beyond the script, Eskil Vogt's work in this shows that he already has the talent of a much more experienced director. From the entire cast to the cinematography, it's beautiful. There's a very sensual side to the film that stands out in unique ways. And, as one might expect for a film about a blind person, sound (along with what we're seeing while hearing these sounds) is important to the experience. Blind has a very lovely score by Henk Hofstede, but it's also all the music that adds so much more to the story. It's often worked in as diegetic sound, that transitions back and forth between background music and sound that interacts directly with the experience. There were a few moments that gave me chills I was so impressed by the scene at hand. Vogt's Blind is one of the most refreshingly original cinematic creations I've come across in recent years and stands out because of that. But it also stands out because it so delicately balances a story about emotional tribulations, intimacy and sensuality, personal relationships and interpersonal interactions, and the many mental struggles of so many people in today's increasingly isolated/lonely society (especially in Norway). It's an incredible new discovery in cinema and a movie that shows artistic storytelling can still be innovative in a time when we get so many original films every year. I have a feeling Blind will stay in my Top 10 throughout the rest of this year. Another outstanding film that I'm very glad to have the opportunity to fall in love with. Oh my GOD! Thanx Alex! Bravo Norway! Bravo to every director & producers that know cinema has important critical tasks and is not just pure entertainment. Movies Have Healing Powers , then , Too bad for Blinds that cant see "Blind".